Glide through one of Savannah's most elegant cemeteries on a Segway PT and experience an enlightening ride through history. 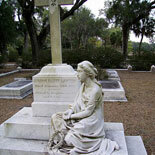 On the Bonaventure Cemetery Segway Tour, you will visit the resting place of many famous people of Savannah that contributed to the city's rich history. Historic Savannah is built around 22 Squares with many interesting forms of architecture and stories. 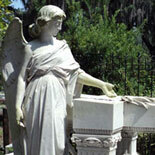 The Bonaventure Cemetery Segway Tour lets you explore one of Savannah's most elegant and historical cemeteries while enjoying the adventure on a Segway. Easy to use and operate. The two-wheeled Segway sports high-tech gyroscopes that automatically respond to your body's movements, "sensing" when it should speed up and slow down. You stand on a small platform between left and right wheels as you hold onto handlebars at a comfortable waist height. The Segway handles the balancing for you, so that you're always upright as you glide through any environment. And within a few minutes of training and tips, you will feel comfortable enough to ride! Learn about Bonaventure's magnificent history and its awe-inspiring residents, surrounded by the beauty of Savannah with her incredible sculptures, majestic live oaks and Spanish moss. 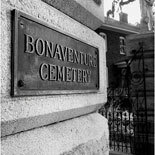 Explore the amazing lives of famous songwriters, poets, silent screen actors, photographers and many other interesting people and events on the Bonaventure Cemetery Segway Tour. Tour the historical district of this beautiful city at a smooth and leisurely pace. 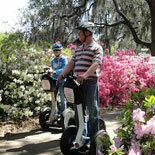 Experience Savannah on a Segway. It's new, it's cool, safe and easy to use plus a ton of fun! 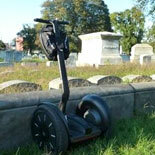 Get your eTickets now for the Bonaventure Cemetery Segway Tour, the perfect way to see a Victorian Cemetery! Tour departs daily at 10:00am. Please arrive 30 minutes prior to your desired start time for helmet fitting, safety video and practice session. Closed Easter, St. Patrick's Day, Thanksgiving Day, Christmas Day. Reservations are confirmed for date selected. Reservations should be reconfirmed in advance. Ticket will contain complete details. Martin Luther King Jr. Blvd. and Liberty St. The Rider must be at least 18 years old (or 14-17 years old when accompanied by parent or guardian) Riders must weigh at least 100 lbs but cannot exceed 260 lbs. Reservations are required at least 24 hours in advance of desired tour. Riders must sign a Release of Liability waiver ~ Riders must wear a helmet at all times ~ Riders should wear comfortable clothing for the day's weather ~ For your convenience, each Segway PT has a storage pouch for taking personal items such as keys, cell phones and water bottles ~ The Rider must be able to step on and off the Segway PT without assistance, which requires physical abilities similar to climbing and descending stairs without the support of a handrail or other walking aid.